A pious man by all accounts, Sallman worked as a freelance illustrator, producing religious imagery for a variety of publications including the Evangelical Covenant Church's denominational magazine Covenant Companion in the 1920s and the Salvation Army's War Cry in the 1930s. The charcoal sketch called “The Son of Man,” which appeared on the cover of the Covenant Companion in 1924, attracted enough admirers over the years that Sallman painted an oil version in 1940. The image was titled “The Head of Christ.” For many people, this image of Jesus, composed like a photographic portrait, looked like the serene “best friend” they wanted in their Savior. The Baptist Bookstore picked up various sizes of the lithographic image and placed it in bookstores across the South. A growing variety of products using Sallman's painting appearedreligious instructional materials, prints, gift items, and eventually clocks, lamps, buttons, mottoes or Scripture texts, Bibles, and puzzles. Impressed by the avid public response, Sallman's publishers urged him to produce several images from the life of Jesus using the same likeness. An enterprising commercial illustrator, Sallman studied many visual precedents used in devotional settings and produced by other religious publishers and based most of his very successful images on them, such as “Christ in Gethsemane,” “Christ at Heart's Door,” “The Lord is My Shepherd,” and “Christ Our Pilot,” produced from 1942 to 1950. The World War II context was equally important for the dissemination and popular reception of Sallman's chief image, “The Head of Christ.” The Salvation Army and the YMCA, both members of the USO, handed out pocket-sized versions of the picture to American soldiers leaving for Europe and Asia. Millions of copies found their way around the world and became a fondly remembered part of the war experience for many veterans. After the war, groups in Oklahoma and Indiana conducted broad campaigns to distribute the picture across private and public spheres. A Lutheran organizer of the effort in Indiana said that there ought to be “card-carrying Christians” to counter the effect of “card-carrying Communists.” Copies of Sallman's “Head of Christ” were placed in public libraries, schools, police departments, community centers, and even in courtrooms. One photograph from 1962 shows Vice President Lyndon Johnson posing reverently beside a copy of the picture sent to him in Washington. Today, the portrait of Jesus is still found in both Protestant and Catholic churches, enjoys fond use among Mormons, Latinos, Native Americans, and African Americans, and hangs in Christian homes in Africa, Latin America, Asia, and Eastern Europe. While Protestants have historically resisted using pictures in their worship, they often do, in fact, rely on Sallman's images and others in teaching children, in evangelism, and in decorating their homes. For many of them, these activities are as important for everyday life as public worship, especially in forming the early faith of children in ways that will continue to shape their piety for the rest of their lives. This is why even a glimpse of Sallman's pictures can open a deluge of memories. The picture hangs around. 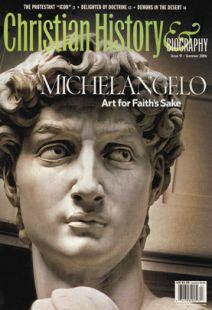 David Morgan is professor of Christianity and the Arts, humanities, and art history at Valparaiso University.